This column lists all application elements that the margins and style classes can be defined for within a DIV container. The entries for the margin size are specififed within the style classes and can be edited specifically for each layout in the Design module. When creating an element in a div container, when moving or copying to a div container or when grouping, the style classes named above will be used. If you move an element with these style classes to a container, which is not a div container, or if you remove a grouping, the style classes are maintained. Each element can be assigned additional style classes here, these will be added automatically to the control when creating an element within a div container. Please pay attention to the correct notation when entering the style classes. You should also note that they are case-sensitive. If multiple style classes are specified, these need to be separated with a space (e.g. "MyFirstClass MySecondClass"). 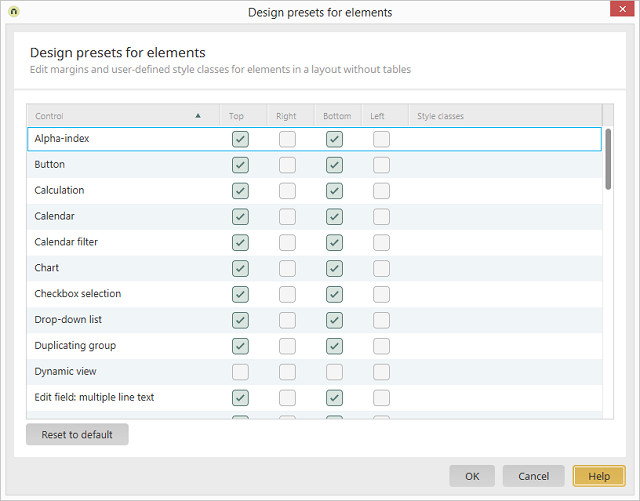 The specified style classes need to be present in the portal layout so that they can be used. Clicking on this button restores all settings to their default values.